Martin Ney, who is believed to be moving on from his diplomatic posting, held last private concert in India at his residence Tuesday. New Delhi: In the red living room of the German ambassador’s residence lies a harpsichord. “The only playable harpsichord in all of India,” Ambassador Martin Ney tells a room full of his closest friends — which include, but are not limited to, justices of the Supreme Court, former foreign secretaries and members of Parliament. “A harpsichord,” he explains, “is the precursor to the piano” — a grand wooden instrument in the shape of a piano, but unlike its evolved form, plucks strings rather than striking them. Apart from his diplomatic duties, the German ambassador to India is known by his inner circle for one more striking characteristic — his deep knowledge of Western classical music and his skill at playing the flute. 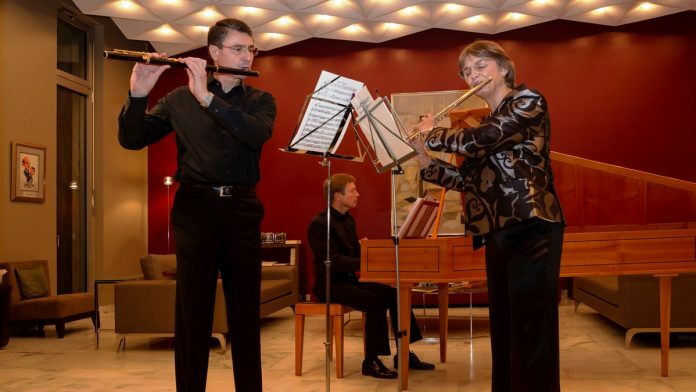 On Tuesday, the diplomat and his wife Gabriele Ney, who is also an accomplished flautist, held their last private concert in India at their residence. In the hour-long concert, the Ney couple played the flute for an audience of over 70 guests, accompanied by world renowned musicians Bettina von Dombois on the violin and Gerald Hambitzer on the harpsichord. “Probably one of the three best harpsichord players in the world,” the 62-year-old ambassador said, referring to Hambitzer. The VIP guest list included Supreme Court Justices Madan B. Lokur, Rohinton Fali Nariman and A.K Sikri, Union ministers Suresh Prabhu and Jayant Sinha and NITI Aayog chief executive officer Amitabh Kant. Ney is believed to be moving on from his diplomatic posting in India after completing a customary three years, making the concert “a very special evening with only dear friends”, as he said. The flute has been significant in Ney’s life in more ways than one — he met his wife in 1979 when they played the flute together. In a 2016 interview, Gabriele said that she met the ambassador when they were pursuing a two-week summer academics programme as part “of a scholarship association in Germany”, The duo played the flute at the programme’s final concert together. Gabriele is a trained medical doctor who has been working in the pharmaceutical industry at various diplomatic postings of her husband. Chamber music has been particularly close to the ambassador’s heart ever since he served as co-principle flautist in the First German Airforce Band during his military service from 1974 to 1976, according to his profile on the official website of the German consulate in India. The diplomat also has a dual Masters Degree in politics and economics from Oxford University, where he was also a Rhodes Scholar. Ney taught constitutional and public international law as a junior lecturer at Würzburg University for three years, where he received his Doctorate in international law in 1985. He continued honing his skill at the flute during his academic education. Prior to his concerts, of which there is one at Bikaner House Wednesday, the ambassador maintains a schedule of disciplined preparation, which involves at least a whole day’s worth of practice with the accompanying musicians. “The ambassador does not want any other issue to be dealt with (before his concert). He likes to concentrate on his performance and will probably just visit his residence to change for the occasion before going back,” Ney’s press officer Ravi Sharma told ThePrint. Apart from Western classical music, the ambassador likes learning about wine, playing tennis and sailing. 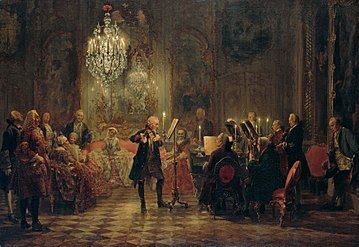 What remains most noticeable from Ney’s interaction with his guests Tuesday is the detail with which the diplomat attempted to recreate German realist painter Adolph Menzel’s 19th century painting in which Frederick the Great is playing the flute in his summer palace Sanssouci near Berlin. “The painting was the inspiration for tonight — a night of music, where you should keep your wine glasses full,” he said. For Ney, the quality of sound is a matter of great importance. Known to criticise the lack of world-class concert halls in New Delhi, the German ambassador made sure that the “acoustics in the room are fantastic”.